As a member of Booklook Bloggers I was sent a copy of the book to review. 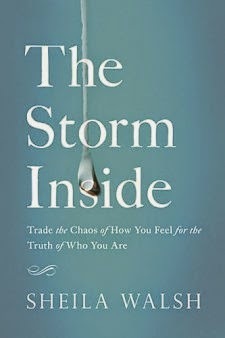 This is titled The Storm Inside Trade the Chaos of How You Feel for the Truth of Who You Are by Sheila Walsh. I really loved this book I love Sheila's writing style which makes this book really easy to study. This book is packed with insightful biblical teaching, intimate stories of her own, which make it a wonderful study book for youself or for a group. All of us have moments in our Christian walk that are filled with Chaos, guilt or fear. I know I have a whole lot of problem with fear as I worry even though I know I should not. Sheila's book really helped me to get past some of my worry and guilt and remember that through anything Christ is with me. No one is perfect and sometimes we feel the shame of our lack of faith or the things we feal. this book helps you get past feelings and focus on God and what he can do to help you feel more free and loved. I recommend this book to anyone who likes a great study book that you can really learn from, from someone who has been there and who feels the same way that you do. I am so happy I got to read it its very comprehensive and will help you find the strength to face the Chaos that life sometimes hits us with.